Fair. Stains on front cover **SHIPPED FROM UK** We believe you will be completely satisfied with our quick and reliable service. All orders are dispatched as swiftly as possible! Buy with confidence! Very Good. Describes pressures that discourage initiative, dull creativity and dissuade risk-taking, and presents ideas on how to create plans that motivate people in organizations to give their best. Sewn binding. Cloth over boards. Contains: Illustrations. Jossey-Bass Management. Good. Describes pressures that discourage initiative, dull creativity and dissuade risk-taking, and presents ideas on how to create plans that motivate people in organizations to give their best. Sewn binding. Cloth over boards. Contains: Illustrations. Jossey-Bass Management. Very Good. 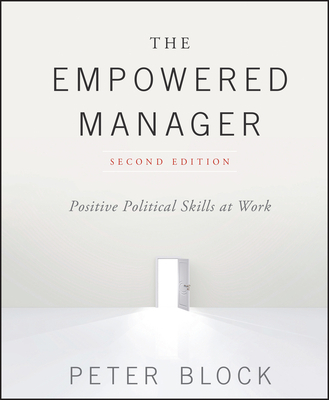 The Empowered Manager: Positive Political Skills at Work (Jossey-Bass management series) by Block, Peter, 1987-01-01. Jossey-Bass management series.. Illustrations.